Somehow it seems like every major game receives some comparison with an earlier reveal video showing “proof” of a visual downgrade from what the studio originally pitched to players. In some cases, visual backtracking is true, while in others, it’s simply different lighting or environments that cause the game to look different. The latest outcry over Detroit: Become Human is something else entirely. 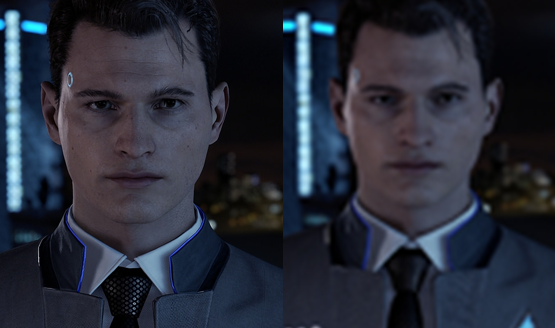 The dust up occurred when a YouTube video appeared that compared recent footage of Detroit: Become Human with footage from a trailer originally shown in 2016. The visuals from the 2018 video seem to be blurry and washed out of all small details with flat textures compared to the trailer from two years ago. The footage taken for the videos and stills in the 2018 side of the comparison video was allegedly pulled from the Detroit: Become Human release date trailer, which hasn’t actually been put out on any official public channels, most notably by Sony themselves. The last Detroit video added to the PlayStation channel was the controversial PGW trailer from last year. If no official channels have the blurry, flat-textured footage that was used in the comparison video, then where did the creator get it from? A quick look at the Detroit trailers on unofficial channels gives us the answer. The Sixth Axis was able to find one Detroit: Become Human release date trailer uploaded by a user that showed a time bar with X, Circle, and L2/R2 button controls for a brief second, and suddenly everything became clear. Users were pulling the trailer from the one shown on the Detroit: Become Human page in the PlayStation Store. It’s doubtful the PlayStation Store streams those autoplaying trailers at the highest bar of quality, opting to quickly load a preview for users rather than waste time buffering the best quality video. Seriously, go take a look at any game video on the PlayStation Store. They all look pretty bad in comparison. The users uploading the video to YouTube then need to capture the trailer in some way, compressing and degrading the quality further, so of course in a comparison video, the janky 2018 trailer that was captured by users from a low quality and low resolution source is going to look a sight worse than the native manually uploaded footage from the 2016 reveal. For demonstration, look at how the exact same image can look “lower quality” after being forced through resizing and compression. Left: Original source image. Right: Original source image screencaptured, resized, and compressed. So, no, there is no Detroit: Become Human visual downgrade. I played it just three months ago in December at PSX and it looked phenomenal. Reserve judgement for when the game releases and actual graphics comparisons can take place. After all, we don’t have to wait for much longer now beforethat day comes.